Over the last few weeks I’ve been doing some further exploration of the impact of Web 2.0 technologies in libraries. My current favourite for keeping up to date is Twitter and delicious continues to be my preferred option for keeping track of essential websites. I’m realising that Web 2.0 is now pretty well integrated into the way I work and I’m also including it in teaching sessions with students. There have been a number of recent reports emphasising the value of Web 2.0 technologies to researchers and commenting on the slow take up. I follow RIN (the Research Information Network) and a number of Library organisations on Twitter for news of research in this area and you can use my links to useful stuff in delicious. For a recent presentation to the Association of Independent Libraries I wanted to emphasise time saving elements of using Web 2.0 and ways of finding resources for staff training. YouTube is great for this – we recently used an entertaining video on roving and many of you will have seen the wonderful “Librarians Do Gaga” with its excellent message about searching library databases. 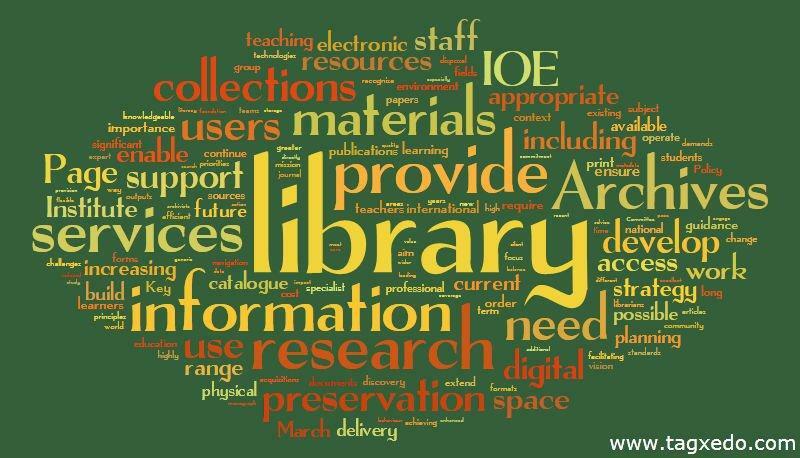 Web 2.0 also gives us alternative ways to present information, such as this view of the IOE Library Strategy. Becky Webster & I have been sharing ideas about using Web 2.0 with Library and Archives staff in one of our regular staff training sessions. Contact us if you’d like to know more. This entry was posted in Library and Archives and tagged library strategy, staff training, Web 2.0. Bookmark the permalink.